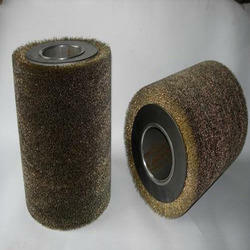 We are offering an excellent quality of Wire Brush. Wide face brushes provide consistent accurate surface finish control for metal processing tasks like annealing galvanizing scrubbing pickling coil casting and many other application they are custom built to your specifications. These helically wound brush feature a hard working welded one piece construction Designed for arbor mounting in your plant for fast easy removal and replacement keeping your process interruptions to a minimum. The dense fill and excellent balance of brush provide a uniform finish lower vibration higher operation speed closer control of the brushing process and higher brushing efficiency to keep the finishing costs down. 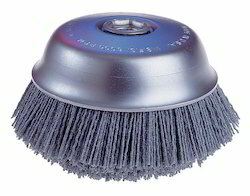 Stainless Steel Wire Brush offered is available in cup brush finish with bridle knotted wire. Wire Cup Brush of crimped wire with suitable keyway in stainless steel wire , carbon steel wire, nylon wire in various sizes. The offered wheels are sourced from most authentic vendors in the market and are precisely engineered using supreme grade metal and ultra-modern tools in compliance with set industry norms. We offer these wheels in number of sizes and designs in order to meet vast necessities of our valuable clients.